It certainly is a very different kettle of fish. I started exploring the ‘eportfolio’ section. For an online student, keeping a portfolio of the different resources you’ve come across, the different bits of writing that you’ve done, and so on, can be quite cumbersome. As a prof, I think I would really like to see what materials my students are using. This eportfolio might address both issues – the student can ‘publish’ a selection of materials from the portfolio to display. So the portfolio feature certainly seems promising. The eportfolio allows the student to upload ‘artifacts’, be they files or links to websites. The screen-shot below shows the creation of a rubric under a page called ‘Achievements’. Presumably this means that I as a prof could set up a rubric for a literature review assignment, and then the students can add materials to their portfolio to indicate that they have ‘achieved’ the goals of the assignment (formative assessment, I guess!). ANGEL ePortfolio 2.1 allows students and instructors the ability to create an evolving picture of educational as well as personal growth and development. It allows individuals to link progress to institutional, course, and personal achievements, and includes the concept of “certified” artifacts – artifacts imported from ANGEL Courses that include grades and instructor comments. ANGEL ePortfolio’s blogging capabilities allow students and instructors to maintain an ongoing record of educational and co-curricular activities. Finally, sharing elements of an ePortfolio can be accomplished by creating “Publications” – custom web pages consisting of various artifacts from a student’s ePortfolio – and emailing or granting other ePortfolio users permission to see specific aspects of one’s work. So on first impressions, the eportfolio allow seems to be an extremely valuable tool for an online instructor. Moodle allows that sort of thing, too, but I’ve not personally had much success with my students in that regard. Of course, that may well say more about the instructor than the platform. 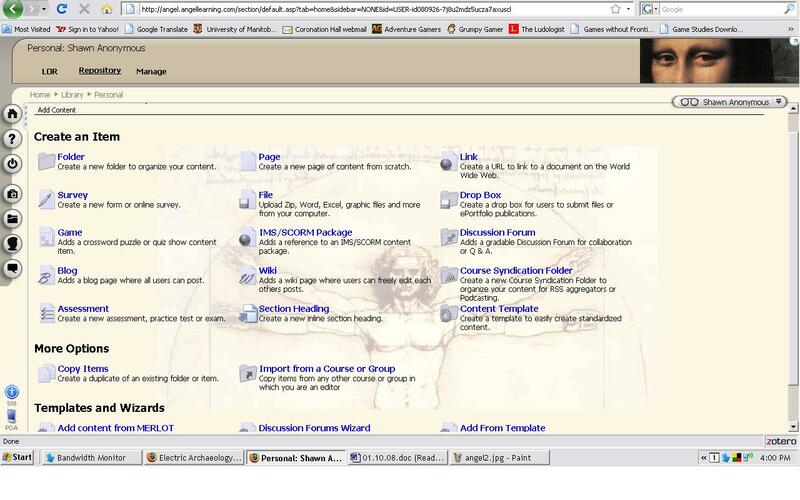 The layout is simpler than in Moodle, but there seems to be much less customization available. The screenshot below shows the ‘art history’ template, and the opening screen that you see when you’re not in the e-portfolio. This next screen shot gives an idea of the various options available to you as an instructor to create your course. Everything is tabbed, once you select a particular option. I set about creating a test, and found it to be fairly similar to setting one up in Moodle, but the layout was much more user-friendly. Some kinds can be automatically graded, others require manual intervention. Next PostTo market, to market we go! Stay far away from Angel. we have deployed it here, and compared to Moodle it is horrid. The failures int the system, speed, student navigation issues, assessment issues and more make Angel unbearable. Right now, I’m doing a bit of work for two different institutions, both of which are using Angel. At the one institution, it seems to work fine – but at the other, it loads slowly, refreshes rarely, and yes, seems to have many of the issues that you raise. At Institution 1, I believe there is a small room somewhere filled with chained programmers working to keep it up and running, but at #2, I’m not sure what sort of support we have. I do know that at #1 they informed us in no uncertain terms to do no customizations ourselves to our course spaces for optimization reasons…. My concern with that is why does a commercial system need so much active support? A room a programmers? or a really light system load, or a sacrificed chicken? I can understand some of the rough edges in Moodle – but even with as much as I use it, I never have to worry about a 3 minute plus load time to send an email. (And that is both local and Angel hosted). In Moodle if I want to do an assignment it takes minutes, and what you see is what you get. In Angel 3 sets of dates, random updates to assignment names when you attache a gradebook item to an assignment (or is it the other way around – who knows) and more than 37 clicks to create an assignment, each tab with a java load and more. Gads. I want to deliver course material, lectures, quizzes assignments and more. Even administering my own site takes less work than running 1 course in Angel. Moodle now, with a new gradebook (forget who from) coming online, Version 2 with improvements and more I feel less and less inclined to work in such a horrid environment. I suppose part of the issue is with the way that institutions have to purchase software packages – if it’s purchased, then copyright and intellectual property issues are nicely and clearly defined to fit into established procedures and policies. Open-source throws a monkey wrench into all of that. That’s not to say that there aren’t universities using moodle & other open source products, though. I imagine it’s as much a problem of culture as anything else. “Even administering my own site takes less work than running 1 course in Angel”. Ditto! I, in fact do exactly that. I teach full-time at an institution of higher ed that has a very large contract with Angel to host their courses. I teach a lot online and have for 6 years. I’ve used Bb, uCompass, Angel, and Moodle. Now I’m teaching an online course adjunct for a second school. 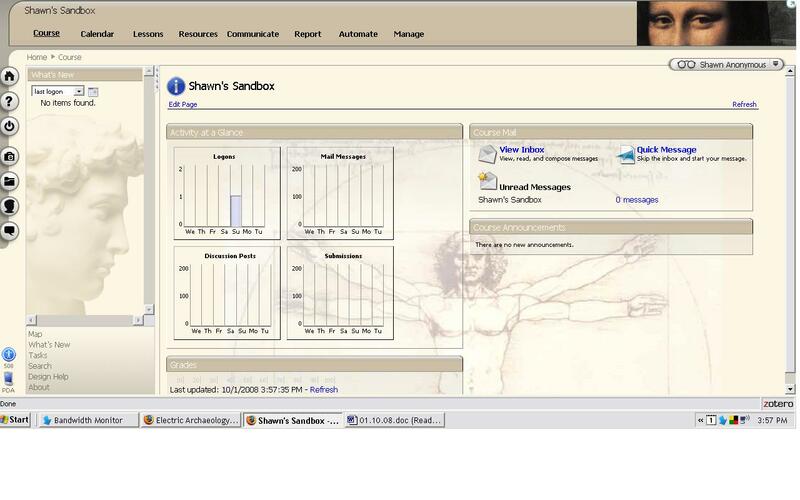 They let me use my own Moodle site – set it up, I run it, I admin it. It’s essentially the same course on both: Angel at one school, Moodle for the other. There’s no comparison. Angel doesn’t cut it. The interface is inconsistent. To do anything as instructor in Angel takes multiple pages, lots of clicks, multiple boxes with scripts loading, etc. Same task in Moodle, go to it, do it, done. Easy. On top of that, is horribly buggy. Angel learning doesn’t do a lot of testing. They use MS tools to write MS-based code for MS servers running MS databases. Some features in ANgel work well with IE7 but not FF. SOme work with FF3, but not IE. Not much works well with Chrome. Nothing really works with Safari. On the other hand, I’ve never had a problem like that with Moodle. In my case, I can admin my own Moodle site and handle the course with less time than it takes to do only the instructor’s job on Angel.